There the title says it all. Till then guys! keep it all cool! November 15 was a memorable day. The night before that I was skeptic that it will not push through because there was a storm and I was confused because I had no idea what to bring (toxic). 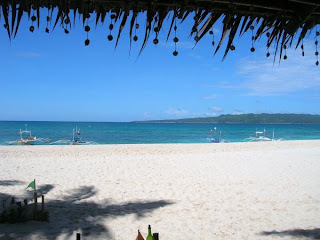 This is my first time and Boracay would be the farthest I have gone south to if it all goes well. I packed the shirts that I need, my rubber shoes, shorts and a lot of underwear and stuffed it all in my backpack. 6 AM, I awoke at the sound of my alarm clock. I cooked breakfast and ate it after and then went straight at the bathroom to do my thing. We agreed to meet at McDonald's Olivarez 9AM sharp. So we met at around a minute past 9. The moment we were complete, the endless bantering began and we couldn't stop laughing. We laughed at the simple things, yeah we're shallow, typical cause we were like this ever since we were at high school. 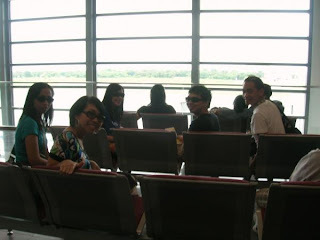 We took the bus to Magallanes where we rode a taxi to NAIA 3. 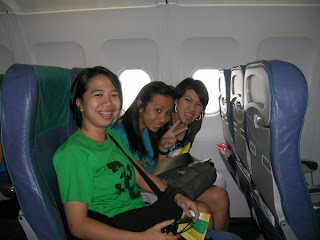 Nhejj, Lorie, Aizel and Gersie was supposed to meet at Makati and will see us there at NAIA. Gersie has always been the slug in our group, a spoiler of fun. It was half past nine when he awoke and the rest was furious, because we can't afford a delay or the plane will leave us, but eventually he made it. 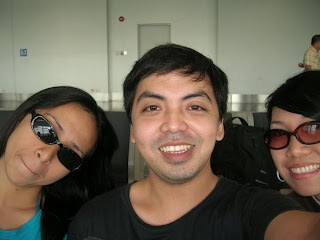 And so we met at NAIA, checked in and waited for our plane to arrive and we took some pictures. 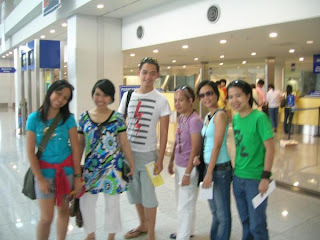 (from the left: Jei, Aizel, Gersie, Weng, Lorie and Nhej) Before paying the airport fee or something I decided to take a picture. A picture of my plane ticket. Yeah, it's my first time that's why. hehe. Who took this picture?? hmmmmm...who's missing... Ah yes, its Nhej. She thought of taking it at the back and directed us to look back so that it will have an artistic effect or something (whatever) but it went well so it's okay. It was 10 minutes past the expected time of arrival of our plane and yet there is no plane in sight. What could have happened with our plane? This is a picture of the tarmac, and there is still no plane in sight. But after about 20 minutes of waiting, talking, laughing, kidding around, the plane arrived. Passengers in the first aisle are called but we took no heed of the ruckus that it caused. But then passengers at the back aisle were called, and we scampered. Inside the plane, we took again some pictures. I felt mixed emotions from then on. 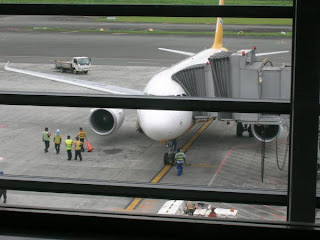 I was scared and happy at the same time, scared because it was my first time to fly, and I was doubtful of how it felt to ride a plane, and happy because we were kidding around all the time. I was at the middle, between Gersie and Lorie. Lorie was at the the window seat, she was so lucky, I wanted to be at the window seat but it was okay, the middle seat would do I thought. A view of my side of the window. 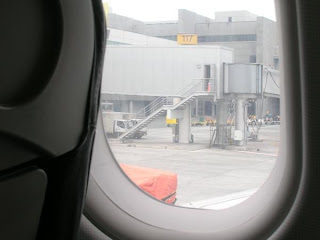 The doors closed and the flight attendants did their thing and I felt all the blood rush in my head. This is it. The plane taxied and the feeling of flight was amazing. So this is what it felt like. I was so naive, but it's the truth. 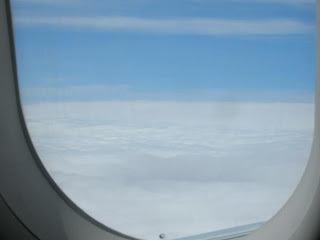 The plane slowly ascended altitude, and the sign for seat belts turned off, some of the passengers went to the comfort room, but I never left my seat, I was too amazed at the scenery outside my side of the window and took some pictures. 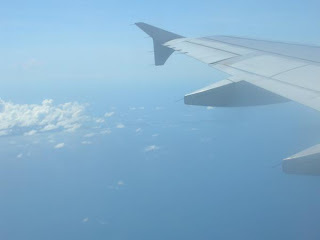 At the height of our flight my cam suddenly malfunctioned so I was not able to take some pictures. 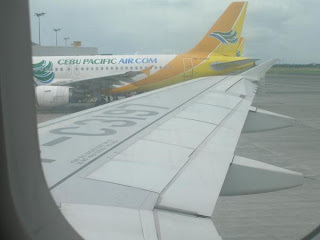 After about 35 minutes, we arrived at the Kalibo International Airport. A man was holding a piece of paper with the name Divina Gracia Serapio and we all chuckled when we saw it, wow, we never expected that we will be greeted this way. A van was waiting outside to transport us to the Caticlan pier. The ride to Caticlan was a grueling one, the intestine-like roads are stomach wrenching, and I had low tolerance to long rides since my vertigo attacks. 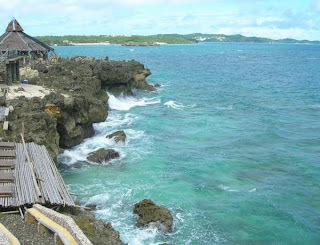 As we neared Caticlan, the coastline appeared and it was a sight to see. But the motion sickness ruined it all. After about an hour and a half, we arrived at the Caticlan pier. Another man was waiting for us to assist us from Caticlan till we reach our hotel. 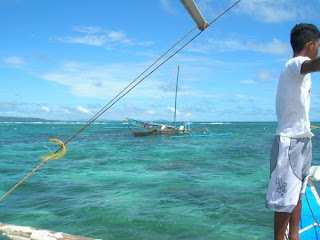 The boat ride was good, Caticlan and Boracay was about 5 minutes apart. 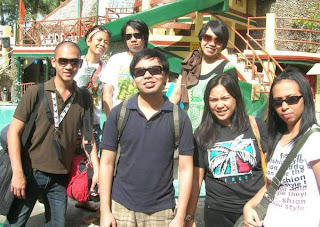 We disembarked the Caticlan pier and rode a mini van to reach our hotel, La Carmela Resort. After checking in and arranging our things, some of us slept. The trip from Manila to our hotel was okay, but the motion sickness wasn't. That night, we partied at a local bar at Station 1. we drank booze and smoked...what was that called, well it was not cigarettes, it was something with charcoal on top. I forgot what it was called. We came at the hotel at around 4 in the morning, and Weng insisted that we have a dip in the pool, but unfortunately it was closed. So we went at the beach and had a dip. While enjoying the cold sea water, Weng can't help but remember Yhen, who recently passed away because of cancer. And we talked about it, suddenly it rained and it felt like a blessing. The feeling of the splash of waves and the gentle trickle of raindrops on our skin was amazing, I never felt something like that before and as the tide ebbed so our tolerance to the cold. The sun was about to peek when we retreated to our rooms. 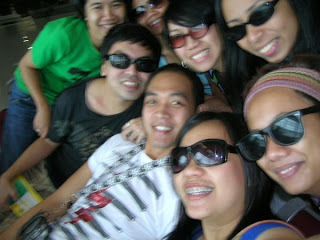 Second day at Boracay: we woke up early, because Kuya Jegan (our tour guide) was at the hotel front already. After our buffet breakfast, we went to station 3 to ride our boat. First stop: crystal cove. we rode the boat full of excitement and we were talking full of excitement and took some pictures on the way, but as we passed station 3, the waves suddenly became wild. It was fun, Gersie, Jei and me were enjoying the ride while those at the back were silent because they were nervous already. But after about five minutes, we arrived at the crystal cove. Well ofcourse, the crystal cove is famed for its crystal caves. It has two of them and both are breath-taking to behold. The path to its caves are a little bit difficult to tread but it was all worth it. Take a look. At the crystal cave2, we came into a tunnel and at the end of it took our breath away. It was so beautiful. After crystal cove it was snorkeling the next. So we went to a snorkeling spot and got our snorkels and dived to mingle with the little fishes. It was amazing. This is a picture of the snorkeling area. I got dizzy after so I never got the chance to take some pictures after. We got to our boat again after about 10 minutes of snorkeling, we went to Puka Beach. 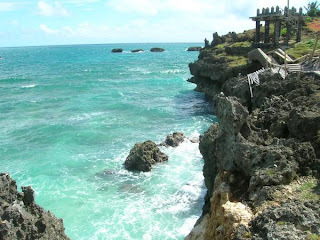 The way to Puka beach was intense, the waves were bigger and wilder. At first it was okay, we were kidding along while screaming our hearts out when a big wave came, but as time passed, it became uncomfortable, we got dizzy of the rise and fall. 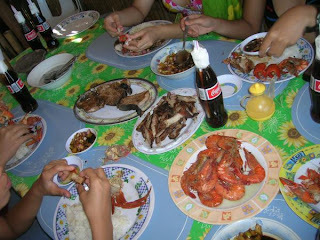 We arrived at Puka beach totally exhausted and famished. But we had a treat, there we ate seafood. Our table was teeming with all sorts of them, crabs, squids, and fish. We also had pork and grilled eggplants. Here's a picture of Puka Beach and our table. After we had our lunch, we rode again the boat to get to station 2 again to ride a bigger and faster boat for our parasailing. It was Gersie and Weng first to try. Next was Nhej and Lorie. Then it was me and Ivy. I had a bad feeling about it at first, because it was so high, and I have doubts about the cord splitting apart, but what the heck, so I gave it a go, and it was scary at first but once we were up there, it was okay. The whole island can be seen atop and apart from the not so usual shifting of the cord to the side, it was a good experience. After the parasailing experience, Gersie, Nhej and Lorie tried jetski. The rest was too exhausted or too dizzy to try. They had a couple of rounds each and then we tried banana boat (hectic isn't it?). 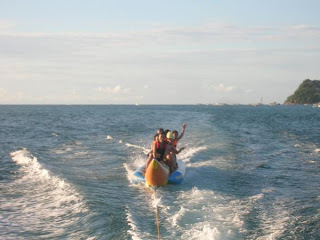 The banana boat was okay, though it was not as exciting as parasailing it was fun nevertheless. The island hopping ended with the banana boat ride. We were transported back to station 1 after. A mini van was waiting for us there to get us back to our hotel. It was an exhilarating day, nothing beats a fruit shake after so we went at..hmmm...I forgot the name, but it starts with J. Anyway, it was supposedly famous for its tasty fruit shakes. And they were right, the shake was good. There we witnessed the boracay sunset. That night Gersie and Weng went out to party but the rest of us are still sea sick to party. So we slept. The third day: I heard the alarm, and got to my feet, it was 7 AM. Time for breakfast. Our flight back to Manila is early so we need to check in early as well. Some of us had last minute shopping for "pasalubong". We checked out at around 10 AM. 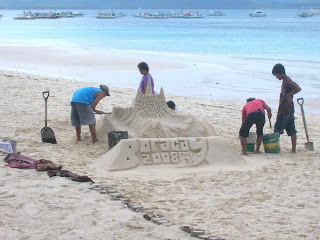 We bade farewell of Boracay and was thankful of the good memories we shared together. The baggage seemed heavier not because of the extra weight but because its really sad to part with a real beauty that is Boracay. 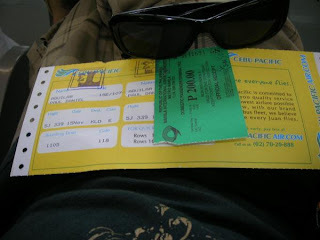 And so we went to Caticlan pier once again, rode the boat, transfered to a van and arrived at Kalibo airport one and a half hour early of our expected flight. While waiting for our plane to arrive, we went outside and had some chitchat, Nhej and Ivy bought some pasalubong for Mae. The plane arrived and we board. 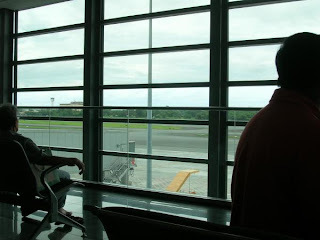 This time, I was seated at the window, yes!. This was what I was looking forward to. Gersie was beside me and Nhej next to him. The plane taxied and had a lift off, and as the plane got farther away of Boracay, I chanced to take a last picture before it faded in the horizon. But it was unnoticeable in this picture. That tiny island there in the wide blue background is Boracay. 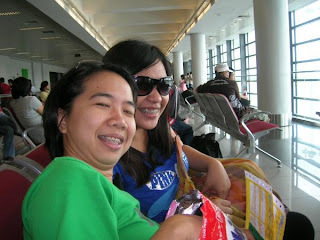 We arrived at NAIA at around 3PM. Back to reality I thought. Somehow the BORA experience seemed like a dream, a distant dream, but none of us were sad as our bantering and kidding around continued till we got to Mae's house to deliver our pasalubong. It was past 8PM when i arrived home. I felt short of BORA but nevertheless all the wait was worthwhile. I thank my bestfriend Ivy for the spectacular experience. Till next time BORA! !